The twins, who are identical on their mother's side but share only part of their father's DNA, are the first case of semi-identical, or sesquizygotic, twins identified in Australia. They are the first worldwide to be diagnosed on genetic testing while still in the womb. Fetal medicine specialist and Deputy Vice-Chancellor (Research) at UNSW, Professor Nicholas Fisk, and QUT clinical geneticist and Diagnostics Genomics course coordinator Dr Michael Gabbett, identified the twins in the paper 'Molecular Support for Heterogonesis Resulting in Sesquizygotic Twinning', published today in The New England Journal of Medicine. The now four-year-old boy and girl twins share 100% of their mother's genes, but are like siblings on their father's side, sharing a proportion of their father's DNA. 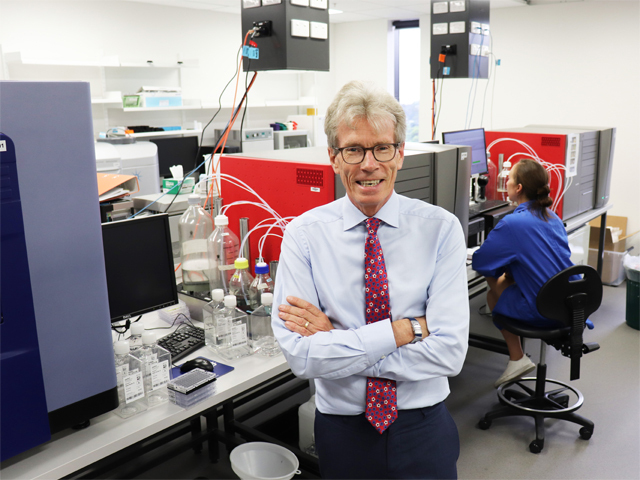 "It is likely the mother's egg was fertilised simultaneously by two of the father's sperm before dividing," said Professor Fisk, who led the fetal medicine team that cared for the mother and twins while based at Royal Brisbane and Women's Hospital in 2014. Professor Fisk, a past President of the International Fetal Medicine and Surgery Society, worked alongside clinical geneticist Dr Gabbett. "In the case of the Queensland sesquizygotic twins, the fertilised egg appears to have equally divided up the three sets of chromosomes into groups of cells which then split into two, creating the twins," said Dr Gabbett. "Some of the cells contain the chromosomes from the first sperm while the remaining cells contain chromosomes from the second sperm, resulting in the twins sharing only a proportion rather than 100% of the same paternal DNA." Sesquizygotic twins were first reported in the US in 2007. The twins only came to doctors' attention in infancy after one was identified with ambiguous genitalia. On investigation of mixed chromosomes, doctors found the boy and girl were identical on their mother's side but shared around half of their paternal DNA. "However, we found no other sesquizygotic twins in these data, nor any case of semi-identical twins in large global twin studies." "We know this is an exceptional case of intermediate twins, also known as a third type of twinning," said Professor Fisk. "While doctors may keep in mind that these types of twins are extremely uncommon, its rarity means there is no case for routine genetic testing."